We are living in a time when our national and global societies are dependent on the innovation and creativity of science, technology, engineering, and math (STEM) professionals to improve the conditions of our planet and our quality of life. As the U.S. seeks to develop homegrown human capital that will serve to meet these goals and a multitude of others, it turns to the educational sector to identify what schools are doing to prepare and inspire the next generation of STEM talent, to evaluate the effectiveness of their practices, and to work toward establishing supportive educational contexts that promote the optimal performance and overall well-being of administrators, teachers, and students. Created in partnership by The National Research Center on the Gifted and Talented (NRC/GT) at the University of Connecticut and the University of Virginia, this eBook combines research data from STEM high school administrators and teachers to provide a snapshot of the current Status of STEM High Schools and Implications for Practice. In Chapter I, the researchers provide an introduction to the status of STEM high schools in the U.S., which includes a rationale for STEM education services in high schools, proposed definitions of STEM education and STEM schools, and examples of schools’ mission statements. 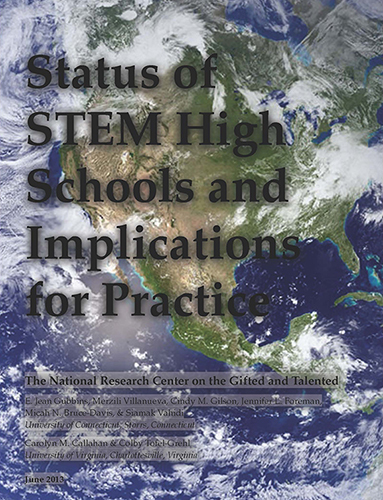 In Chapter II, they present the results of data collection for several variables in the NRC/GT STEM high schools’ database, examining trends in the establishment of STEM high within certain intervals of years from pre 1900 to the present day, and surveying the current landscape of schools across the country by type of service delivery model and demographic composition by type of community, school organization, and level of admissions criteria. In Chapters III and IV, researchers present a summary of study findings for a survey created to gauge STEM high school administrators’ and teachers’ perceptions of the importance and frequency of a series of curricular and instructional strategies implemented in high schools classified as STEM or STEM-focused high schools, and offer commentary on sound educational practices that may guide current and potential future stakeholders interested in developing quality STEM high schools. In Chapter V, the researchers discuss the perceptions of STEM high school administrators, teachers, and students with regard to curricular and instructional practices, academic rigor, and support for student success, as revealed during focus group interviews during onsite visits to STEM high schools with varying designs; correspondingly, they impart implications for practice. Chapter VI serves as a conclusion to the eBook, in which the researchers provide a recap of what is known and unknown about STEM high schools, and introduce potential directions for future research. Finally, Chapter VII offers a preview of the STEM High Schools’ Interactive Matrix. To learn more about the STEM Interactive Matrix, click here. The eBook can also be accessed through the iTunes application. To access the eBook from iTunes, continue with the following steps. Step 2: In the search box at the top right corner of the page under “iTunes Store” tab, type search keywords from the eBook title (e.g., Status of STEM high schools). The book cover will be displayed in the main window.